We are thankful for the way God worked through us and went before us in 2015. She was just one of many we’ve been blessed to see the Lord touch with His love and power as we’ve ministered both here and abroad this last year. 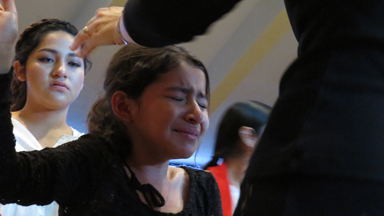 Young girl about 10 years old who was filled powerfully with the Holy Spirit and healed when we prayed for her! Ministering to a young boy who was filled powerfully with the Holy Spirit that day, along with many others who also were filled with the Spirit of God that day! It was a blessing to return to Europe and minister in Norway, Sweden, England, and France once again. We witnessed people get saved, healed, and filled with the Holy Spirit as the Lord led us by His Spirit and we felt the Gospel was advancing forward and making breakthroughs. The Lord did so much as He led us and went before us. We were ministering at a youth group in Norway and there was a bit of a cell phone distraction going on. So, in order to get and hold their attention, I felt led to share some Holy Ghost Surf Stories with these kids, telling how the Lord has given us wild divine appointments in different places around the world and often supplied surfboards, or waves, or places to stay, in unique and supernatural ways. We then began to minister as the Holy Spirit moved upon them. After ministering to some of them as the Lord filled many hearts, there were a few that were just watching and not really participating, so we felt led to ask if they had ever accepted the Lord in their lives. Well we ended up leading four of those youth who had come that night to receive Christ as their Savior. We explained the Gospel and then prayed with them to receive Jesus! The Bible says the heavens rejoice whenever someone receives Christ, so it was four times the rejoicing that night! 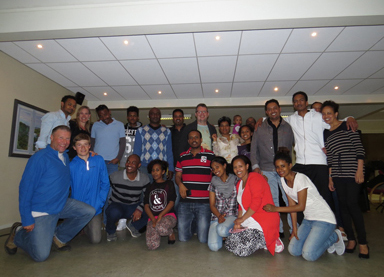 We also had four more people get saved the next night in a service geared towards immigrants when we ministered. There were also many who got baptized in the Holy Spirit as well as experienced healing as the Lord poured out His presence. As if to put the icing on the cake after having just shared about some of those Holy Ghost Surf Stories with the kids, we ended up experiencing one that very weekend. The pastor’s sons just happened to bring along some surfboards for us all and wetsuits—gotta have wetsuits in Norway!—when we went to minister at the church a couple of hours away on Sunday morning. We would be preaching at two services but we had plenty of time in between them for a go at the surf should there just happen to be a few waves. We all knew it was a long shot for it is very, very, rare for the little bay along the coast in the town of Mandal to get waves. First of all it is a protected bay that must have just the right winds and swell to generate the right conditions for the waves to break. Furthermore, surfing in Norway typically means driving up and down the coast all day hunting for the rare odd spot that might just break. Having waves come to you when and where you want them to just doesn’t happen there! Especially at this little bay that rarely breaks! However, God can override all natural factors. And He did! For lo and behold there were some rideable waves breaking in the little bay when we had a look after preaching at the first church service. The weird thing was, there wasn’t even any wind when we looked; whenever there is surf there it is accompanied by strong winds…wow! Well, we had more than enough time in between church services for an enjoyable, fun, surf session. We had just experienced an awesome service right before this where the Holy Spirit moved gloriously as we ministered! Now we were getting to go for a surf in between services at a spot that rarely breaks. A friend said, “Hey, what’s up here? This spot only seems to break when you’re in town huh!” Sometimes God’s grace is surprising and overwhelming in blessing us in ways that are meaningful to us personally! Glory! 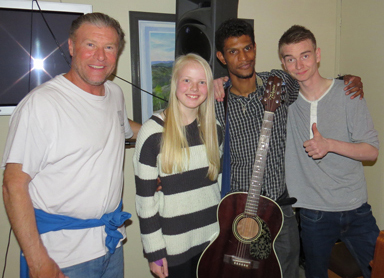 Immigrant church in Norway (right) and some friends from the youth group (above). As we ministered 4 people got saved in each meeting respectively (8 total) and many others were filled with the Holy Spirit and some healed! We ministered at the El Calvario Youth Camp right upon our return from Europe. It was a phenomenal time as the Holy Spirit just poured God’s glory, power, and love, so richly over the meetings. The meetings literally just kept going and going and going way late, late, late, into the evenings. The Spirit of God met us all in such a powerful and refreshing way it just overwhelmed us! We also heard some powerful testimonies of the Lord’s transforming work from many people who came, including one from a young man named Javier who told us how the Lord just brought such a change in his life after we prayed for him at the camp. We were touched to see such open hearts getting filled, ministered and empowered in such an awesome way! Bryan ministering at the Soboba Native American Reservation at the Arise Missions Conference. We had a powerful ministry time that had many empowered to go out with the Gospel! Ministering at Canyon Christian Center where we experienced some powerful healings and a refreshing time as we prayed for people! We had some friends from Sweden connected with a church we ministered at when we were in Sweden recently, who happened to be over here studying at a ministry training center and who wanted to connect and also have a surf lesson. Well we got to hang out, give them a fun lesson, and pray for them as well to be filled with the Holy Spirit and the Lord met them in a powerful way when we ministered to them. 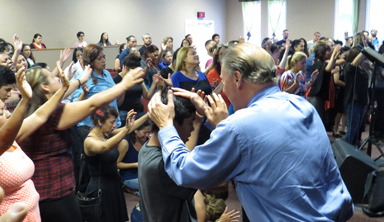 We were blessed to minister at the Arise Mission Conference on the Soboba Indian Reservation. 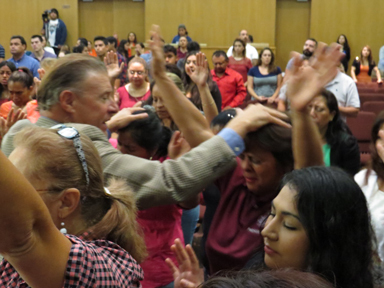 It was a big blessing after preaching and then praying over the people to see many empowered with the Holy Spirit. The Lord powerfully filled many people with His presence as well as inspired them to take the Gospel out to other nations, both big and small. We shared at a pastor friend’s recent ministry celebration where the Lord gave us a message of encouragement. 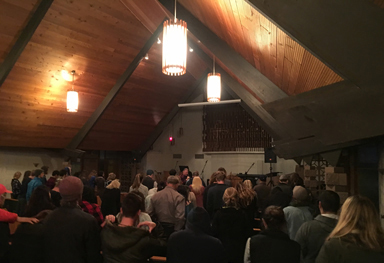 The Lord brought forth a release of hope and vision as we shared and prayed for the group gathered that night. Ministering at Casa de Oración/CdO Church where during the four services in a row we preached and ministered at we saw so many, filled, healed and saved! 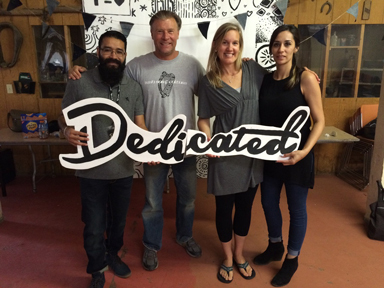 “Dedicated Youth Camp” where we ministered after returning from Europe and experienced a phenomenal outpouring of God’s love and power that extended the meetings late, late, late into the evenings! 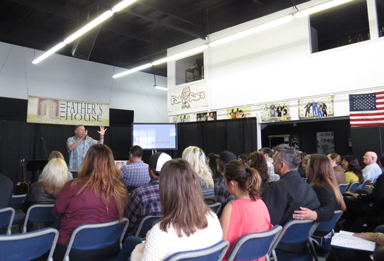 We had an awesome time ministering at The Father’s House in Huntington Beach just recently. The Holy Spirit met us in power after sharing about early days at Calvary Chapel and then the Vineyard and getting filled with the Holy Spirit! It was a blessed time as the Lord met us and we connected with those who have similar roots to ours in those movements. We also just ministered in Orange at Centro Cristiano Esperanza. The Lord poured out His Spirit after sharing about how God uses our trials for good when we persevere and lean into Him. We also had a divine appointment at the end of the day after the service was well over. I was walking out the door of the almost empty church building at that point when a family came up to ask some questions. They said they would like to get prayer but don’t really understand it all or how it all works. After asking them some questions it was clear they had never received Christ as their Savior. They had a Catholic background but had never heard the Gospel explained to them. I took some time to explain the Gospel to them and inquired if they would like to receive Christ. They responded very affirmatively and we led them in the sinner’s prayer to receive Jesus. Hallelujah! The Lord filled their hearts and the father of this family got touched especially powerfully with his hands in the air and tears streaming down his face as we prayed for him. So awesome to see one so newly saved getting so touched! Glory! 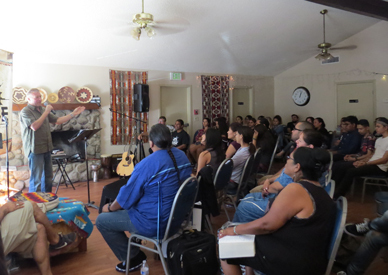 We recently ministered at IV Church in Santa Barbara which is an outreach to students at UCSB. It was a good follow up after recently ministering at their retreat. The Holy Spirit continued to fan the flames and empower those who came. There were also some coming from Westmont College who have been learning about power evangelism, so it is good to the see the Holy Spirit move on them in power! We shared about some historical figures like Luther and Wesley and how they encountered the Kingdom of God and Christ’s grace and also told a few Holy Ghost Surf Stories. Incredibly, after sharing some Holy Ghost Surf Stories, we experienced a Holy Ghost Surfing Miracle the next day. After sleeping over at the pastor's house we went to check the surf. It was epic conditions and no one was out hardly; we went out and had some great waves. This was at a point break right below the campus! To experience an uncrowded point break, especially one right on a college campus in this day of crowded waves was just amazing. We were blown away that nobody ever came out there until we were leaving! There was just one other local we were surfing with who said, “Enjoy this moment, it is never good like this and yet uncrowded at the same time.” After the long drive up there, through a heavy storm with strong winds, and all the efforts that go into ministering some distance away, that was a nice blessing from the Lord! 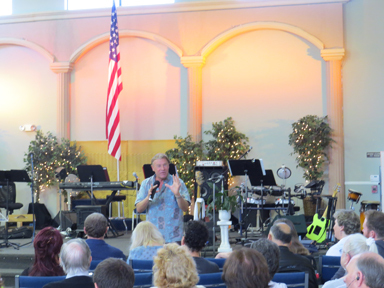 Ministering at The Father's House in Huntington Beach. It was a blessing to share history with the Holy Spirit back in the Vineyard days. Preaching in Isla Vista Church where we had a blessed Holy Ghost service and a Holy Ghost surf session afterwards! Thank you so much for your prayers and support, as they bear much fruit through what Christ is doing through this ministry! We are so grateful and appreciative!